Our next tattooed poet is Bianca Spriggs! 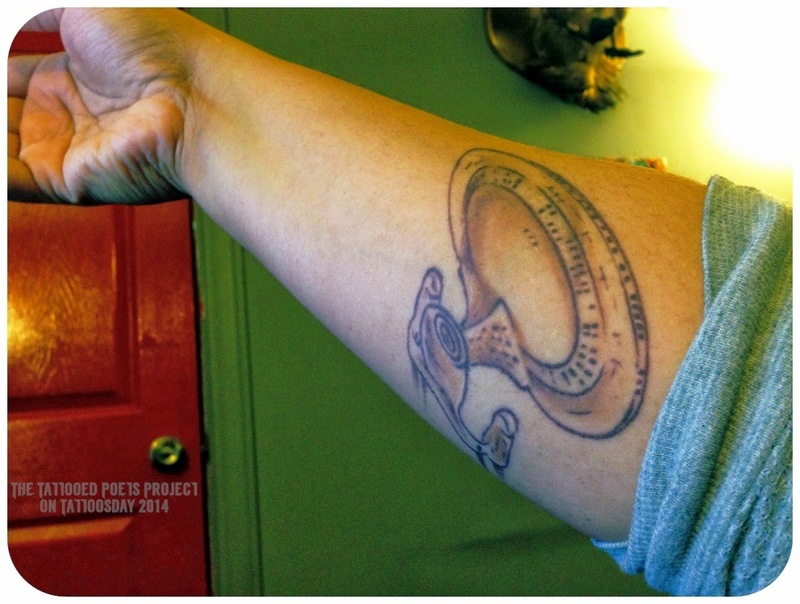 "The first is a tattoo of the USS Starship Enterprise NCC 1701-D. I got this for a wedding anniversary gift from my husband in 2011. I'm a serious Star Trek fan and was reared on Star Trek: The Next Generation (I literally had collector's cards of the characters stashed in my childhood photo album alongside my relatives), so I figured what better way to make it official? I get all of my tattoos in brown ink because I always thought it'd be neat if they looked like I was born with them—like very intentional birthmarks. The artist, Joe King of Studio Ink at the time, was amazing. I barely felt the needle and this one, given the brown, has held up the best of them all. He has since moved to Easthampton, MA [working at Off the Map Tattoo]. Here's a link to his work: http://www.artofjoeking.com/." Bianca sent us the following poem which, she explains, is "in the voice of Guinan, the El-Aurian bartender in Ten Forward from Star Trek: TNG, who was played by Whoopi Goldberg:"
What I do is not listening. to which we all know the words. I did not always understand. as seriously as a final exam. our road trips must have been. with conversations sidewinding around me. in the room no one noticed. what I had already thought to say. and leaving the same message. fumbling for meaning we already possessed. They say I’m a good listener. mixing your voice in with a drink. Bianca also directs us readers to the poem, "a contrapuntal, that people are now walking around with bits of tattooed into them" here. Affrilachian Poet and Cave Canem Fellow, Bianca Spriggs, is a writer and multi-disciplinary artist based in Lexington, KY. She is a recipient of an Al Smith Individual Artist Fellowship in Poetry and multiple artist grants from the Kentucky Foundation for Women as well as a Pushcart Prize nominee. Bianca is the author of Kaffir Lily (2010) and How Swallowtails Become Dragons (2011), and the creator of The SwallowTale Project: Creative Writing for Incarcerated Women. She is the creator and Artistic Director of the Wild Women of Poetry Slam held annually at the Kentucky Women Writers Conference and serves as the current Managing Editor for pluck! The Journal of Affrilachian Arts & Culture. You can learn more about her numerous shenanigans here: www.biancaspriggs.com. 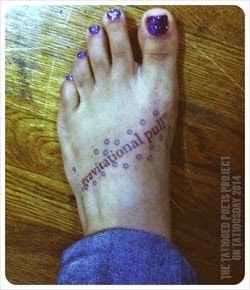 Thanks to Bianca for sharing her cool tattoos and poetry with us here on The Tattooed Poets Project!